Great games are magical. They allow players to escape to new worlds, turn into superheroes, and boost their puzzle-solving powers. Now, more than ever, developers like you can become gaming legends who run successful businesses too. To help you get there, we’re sharing several new innovations designed to grow your fan base and earn you more revenue from your apps. In a sea of mobile apps, it's critical to reach the right players at the right time and place. 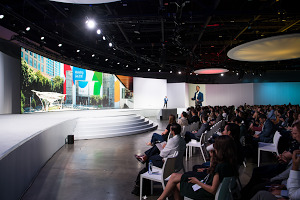 Universal App campaigns (UAC) use Google’s machine learning technology to find loyal fans across Google.com, Google Play, YouTube, and over 3 million sites and apps in the Google Display Network. To date, Google has delivered over 10 billion app installs for developers through ads.1 And we’re just getting started. Over the next few months, we’ll roll out a beta for click-to-play video ads—a new way to reach players on Google Play with sight, sound and motion. These placements will help you showcase your game as they tap, swipe and scroll to find their next favorite app. But we have more to do. Today we're introducing similar audiences for UAC to help you find people who share similar interests with your best customers, right when they’re interested in games and apps like yours. Imagine you’re a developer with a popular mobile game and you’re launching a new title. With similar audiences, you can share your business data with Google to find more players like those playing your current game. By connecting you with more qualified customers, similar audiences can help unlock new opportunities to grow your business. Similar audiences will be available in beta to select advertisers starting in May. Last year, we made it easy for you to deliver rewarded video ads lasting 6 to 60 seconds in portrait and landscape modes. Today, we’re introducing two new rewarded ad experiences that will become available to AdMob developers over the next few months: playable ads and multiple-option video ads. With these new formats, you can monetize your games while ensuring your players can interact with ads in a way that doesn’t interrupt their game play. We know mediation is an important strategy to grow revenue from different ad networks. But you’ve also told us mediation can be difficult to manage. It’s time consuming to reconcile reports and chase payments from different partners. Implementing multiple ads SDKs increases development time and slows down your app. And, more than anything, mediation is based on historical CPMs, so it’s possible you’re leaving money on the table. Our new beta, Open Bidding, takes monetization to the next level. Now, networks can bid to serve ads in your app simultaneously in a single unified auction. The result: increased competition that could lead to higher revenue. Also, there are fewer SDKs to implement, payments are simplified, and you’ll get meaningful insights from integrated reports in a single performance dashboard. Open Bidding is already live with bids from Smaato, Index Exchange and OpenX. We’re looking forward to adding even more networks over the next few months, including AdColony and Vungle. That way you can earn more from your apps and get time back to make them even better. To learn more about these innovations, please join us at the Game Developers Conference next week. My team and I look forward to sharing more details on the work we’re doing to make it easier for you to become the GOAT of mobile gaming. 1. Google Ads Data, iOS/Android, Global, March 2018. 2. Google Ads Data, iOS/Android, Global, March 2018. 3. Google Ads Data, iOS/Android, Global, Jan 2016 - Dec 2017. 4. Google Ads Data, iOS/Android, Global, Jan. 2018.